Mango is the King of Fruit. 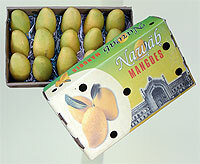 India is having over 1000 vareities of Mangoes. Among these over 21 vareities are recognized as commercial. Following vareites are packed in our centre. Large ovate shape, sweet taste, and pleasant aroma. Oblong shape with pleasant flavour and sweet taste. Skin is medium thick and lemon green color. to clean, grade and pack the mangoes. Packing: 3 kg and 5 Kg boxes.